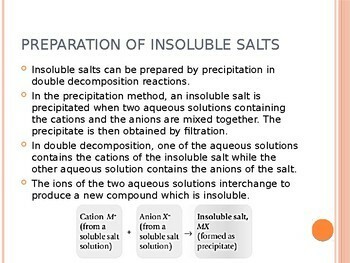 39 Slides providing a compact and complete understanding of formation and identification of salts. Content includes the solubility test of nitrates, chlorides, sulphates, carbonates, hydroxides, quantitative analysis of salts includes understanding mole ratio, moles (mass and volume of salts and products formed), calculating concentration and molarity of aqueous reactants. 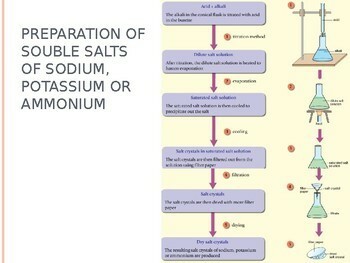 Methodology of creating salts includes acid + base reactions, acid + metal reactions, acid + carbonates reactions, double decomposition process (precipitation). 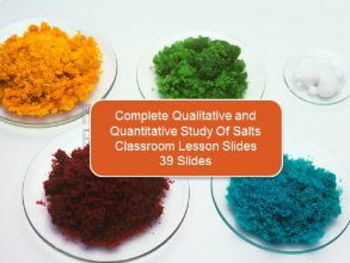 Content includes qualitative study of salts by identifying and analysing salts by carrying out various test such as the colour test of the salt (by observation), gas test (colour of gas, pH of gas, smell and confirmatory test such as limewater, lighted and glowing splint), aqueous sodium hydroxide test (by adding a few drops until excess) and aqueous ammonia test (by adding a few drops until excess). 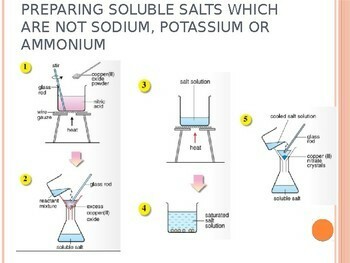 Special confirmatory test of nitrates, chlorides, sulphates and ions are included as well. Content is sufficient for 4-5 consecutive classes. Suited for students in KS4.